Coffrets à estampe in the collection of the Department of Prints and Photographs, Bibliothèque national de France (BnF). In a time of digital images, tweets, posts and SMS, it is especially meaningful when one engages with the physical substance of objects from the past. 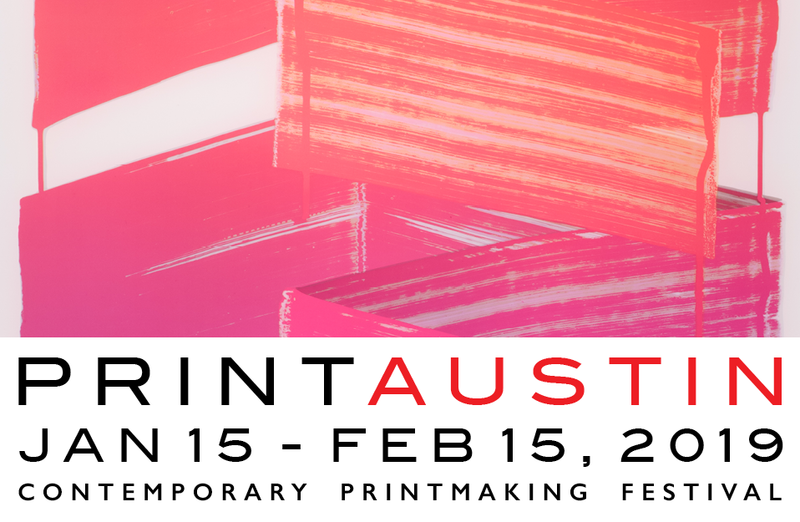 In comparison with sculpture, painting or architecture, prints inhabit a distinct kind of materiality. An object in two dimensions supporting an image, the print was and still is often discussed as either a simple vehicle of iconographic content or as the servile assistant to some more ‘noble’ art like painting or drawing. 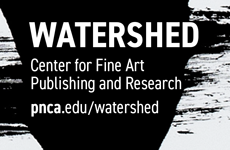 But as all connoisseurs of the medium know, the realization of a print requires as many interventions, implements and materials as a marble bust, an easel painting or a pastel drawing. I would argue that, more than other types of work, the print’s “postproduction” uses make it a material object by definition. 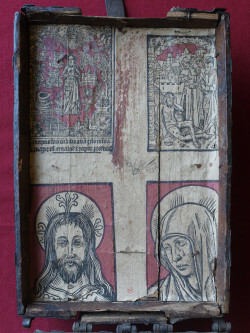 The prints from the late Middle Ages that were pasted into boxes are an excellent example. Coffret à estampe, closed. Paris, BnF, Département des Estampes et de la Photographie, Réserve Ea-5q-Objet. Coffrets à estampe are small wooden boxes, usually of beech, covered with leather and laced with strips of iron, whose inner lid is decorated with a hand-colored woodcut.1 [In English these are sometimes called “messenger boxes” or “missal boxes,” but as their original function is not actually known, we have opted to keep the French term in this article.] The box fronts typically feature a metal armature involving decorative lock plates, a very simple locking device and a hasp. The covers are of two types, flat or domed; the flat ones feature a hollow several millimeters deep cut into the center of the wooden board that forms the lid. Over this is hinged a second piece of wood covered with leather; once this is closed, the hollow compartment goes unnoticed. These components are found from one box to the next, sometimes with variations, but defining a homogeneous corpus of about 130 boxes. Though the prints are less consistent stylistically and materially than the boxes, more than half can be attributed to a single Parisian studio active between 1490 and 1510, that of the Master of Very Small Hours of Anne of Brittany, now identified with the painter Jean d’Ypres.2 It should be considered that in all known boxes of this type, the prints are French and datable between the 1490s and 1550s. em>Coffret à estampe with secret compartment in lid, open. Paris, BnF, Département des Estampes et de la Photographie, Réserve Ea-5q-Objet. 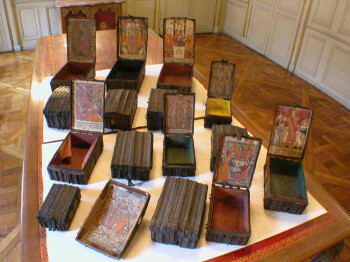 In the study of these boxes conducted by myself and Michel Huynh, curator at the Musée de Cluny, we made physical observations of both box and prints central to our efforts, to better understand the characteristics of the whole object, and also to test the validity of existing assumptions about how the boxes had been used. 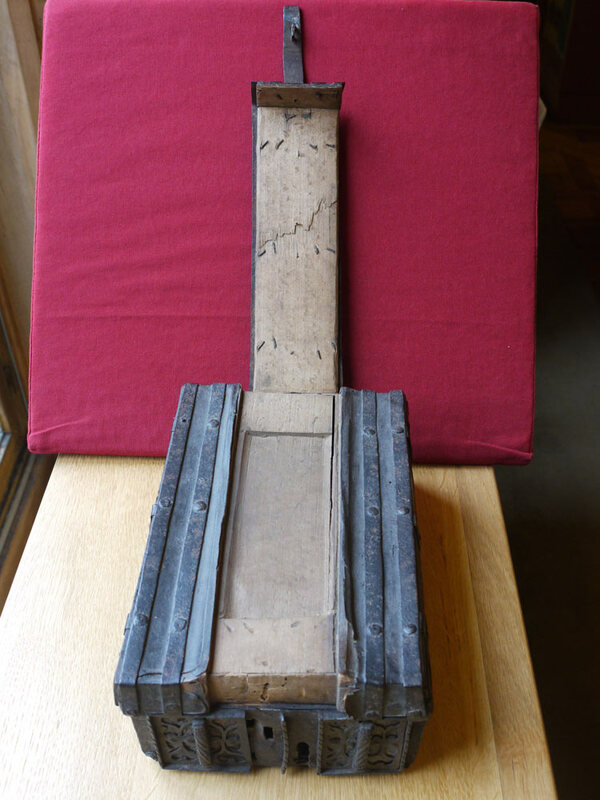 Given their structural fragility the coffrets à estampe must not have been intended to travel long distances; they could not have been used, for example, for direct transport of goods on a pilgrimage nor to serve as boxes for professional messengers plying the roads. They could, of course, be transported (as the side fasteners and little leather-covered straw cushions that are still present on some boxes show), but certainly not for a long trip, unless enclosed in a larger container. Of the various hypotheses about their function, the idea that they were book boxes seems the most likely since they constitute one of the rare instances of a medieval furnishing that is longer than it is wide. The ratio of dimensions of the interior of the body (length greater by one third than the width) corresponds to the book proportions. Woodcut on interior of lid of the coffret à estampe. Paris, BnF, Département des Estampes et de la Photographie, Réserve Ea-5q-Objet. The print affixed to the inside is also critical to their role, and the fact that nearly 90 percent of the glued-in prints carry religious iconography and are accompanied by lines from the liturgy (with a strong axis devoted to the Passion of Christ among the works attributed to the Parisian workshop of Jean d’Ypres) invites one to see this as a medium of devotion. 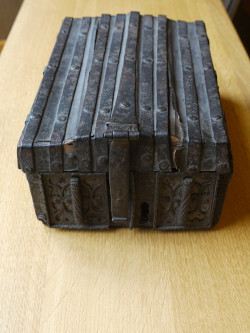 The shallowness of the hidden compartment in the boxes with flat lids, their semi-fixed locking system and the desire for this compartment to pass unnoticed, suggest it might have served as a location for a relic or something similar (a piece of linen that had been in contact with a holy body, a medallion, or an authentique).4 In brief, coffrets à estampe could be book boxes, not just for missals as has been suggested,5 but for related books of devotion. These would have been consecrated by the presence of a relic, and the print would operate as an image of meditation. The use of the conditional is in order, because we currently have no iconographic source or contemporary writing that can shed light on these objects. These conclusions arise strictly from the examination of the paired object-print. It is also clear from our study that the prints were not made expressly for the boxes. The fact that a very large number can be attributed to one workshop probably indicates an opportune association between the box manufacturer and the print producer, but we should not conclude that the prints were made solely to be pasted into boxes, not least because of their presumably large editions, very much larger, in all cases, than would have been needed for making boxes. 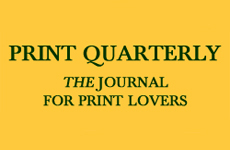 Furthermore, the sizes of the pasted-in prints often do not correspond to the cover on which they are placed. The print and box combination might thus have been initiated by the owner of the box, in keeping with the practice of appropriating and customizing prints prevalent in the late Middle Ages (and still today), constituting a true anthropological dimension of the print.6 Finally, certain boxes show an assemblage of more than one print, each created independently. The coffret à estampe to which we will turn our attention is one of these. 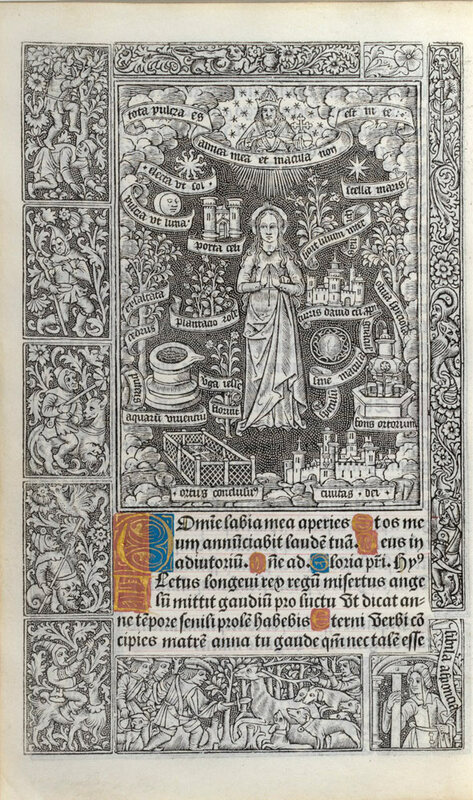 Jean d’Ypres, Virgin of the Litanies, metalcut print, Book of Hours (Use of Rome), published by Thielman Kerver, Paris, December 1502. The box in question was bought at auction in 2010 by the Department of Prints and Photographs at the BnF.7 Its previous owner had assembled a considerable collection of typologically diverse metal objects ranging from mortars to locks, cooking utensils and sewing implements.8 No doubt the print box (there were in fact two) had been included for its iron cladding and the exterior lock and hasp, rather than for the prints inside or for its theoretical function. From the point of view of the box, it does not differ from the known corpus. The exterior, the flat lid, the fasteners and the metal straps are similar in all respects to other coffrets à estampe, and it has a functional hidden compartment cut in the same manner. The use of print, however, is more unusual, consisting of four separate woodblocks printed together on the same sheet, yet not referring to a single subject. Furthermore, the styles of these four matrices do not suggest a single source. The block at the upper left shows a Virgin in prayer, floating in air and surrounded by elements symbolizing her purity. This iconographic theme, the Virgin of the Litanies, developed in European art of the late 15th century and was one of the earliest attempts to represent the Immaculate Conception. At this time in Paris, and in France as a whole, devotion to the Immaculate Conception of the Virgin was soaring,9 but it was thanks to the print that this particular iconography was so widely diffused. The first such composition in this medium was provided by the atelier of Jean d’Ypres for the publisher Thielman Kerver, who as of 1497 was preparing a new cycle of illustrations for a printed Book of Hours (use of Rome). 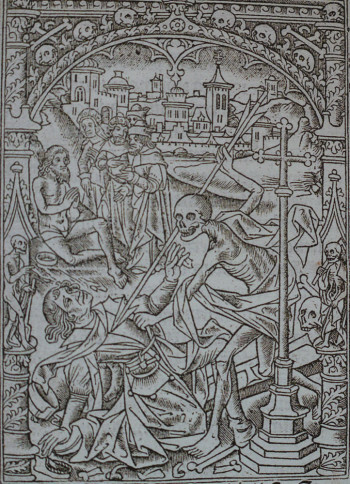 This print was used for the first time in an edition produced in December 1502.10 In execution as well as dimensions, the version glued in the box is identical to the illustration in the Book of Hours, so we can assume either that both arose from a single design or that one is a copy of the other. 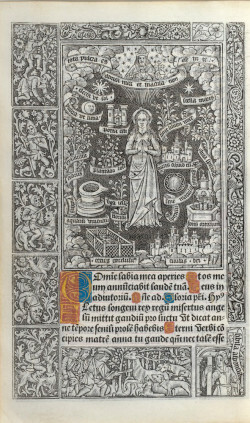 The only difference between them is the technique employed: the print in the box is a woodcut, while the one in the Book of Hours is a relief printed metal cut, the technique known as criblé, which allows greater finesse. Jean d’Ypres, Young Man Encountering Death and Job on a Dung Heap, metalcut print, Book of Hours (Use of Rome), published by Thielman Kerver, Paris, April 1499. Thus, the woodcut of the Virgin of Litanies in the box was either made shortly before 1502, if it is the prototype for the Book of Hours illustration, or just after, if we consider it as a copy. It affirms the style of Ypres, as do many of the prints that adorn these boxes, but to our knowledge it is a rare example of inspiration drawn from materials intended for printed books. Although the prints in this style found in boxes often repeat compositions provided for printed books, they are usually much larger (averaging 23 x 16 cm) and always differentiate themselves in certain elements, as if the workshop or artist intended to diversify some motifs rather than to multiply them identically. The subject of the woodblock on the upper right is Job on a dung heap mocked by his friends, and it is also stylistically similar to the work of Jean d’Ypres: the faces, costumes, and the efficient layout of the turrets and roofs of the landscape are all characteristic of his productions. The dimensions again suggest that it may have been inspired by an illustration for a Book of Hours printed in Paris in the late 15th or early 16th century. We have not, however, been able to locate the relevant work. The scene is framed by a column and arch surrounded by leaves, which is not found in any of the series Jean d’Ypres made for Kerver, Simon Vostre or Antoine Vérard. The only similar image is one printed by the Atelier d’Ypres for the same cycle of illustrations that includes the Virgin of the Litanies. 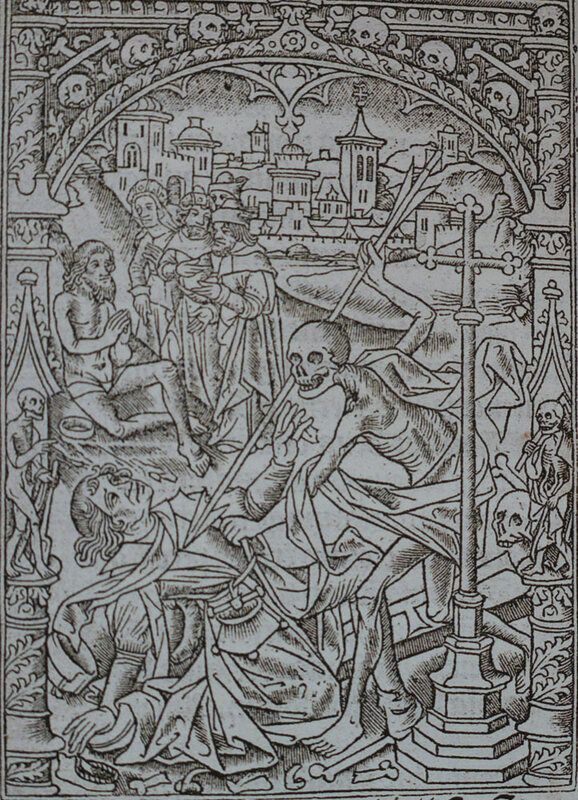 Depicting the ‘Office of the Dead’, the foreground show a rich young man killed by Death, depicted in the guise of a skeleton, while in the background we see Job on the dung heap. This background scene presents a visible variant on the box print: Job is visited by his wife and prays, hands clasped. The only element common to both prints is the character on the far right. Jean Bourdichon, Virgin in Prayer (1480-90), illumination on parchment. Paris, Musée du Moyen Age, Thermes et Hôtel de Cluny, Inv. Cl. 23798. 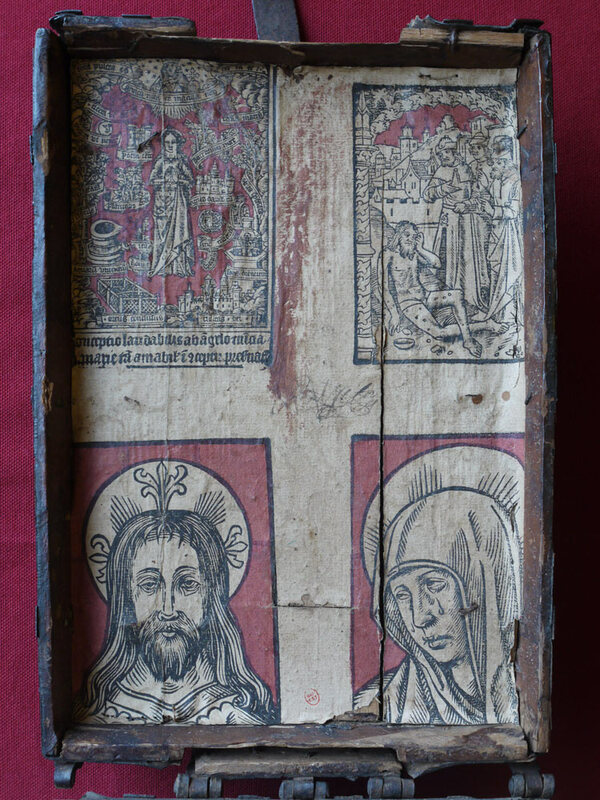 The two prints in the lower register of the box lid are reminiscent of the diptychs that unite Christ Blessing with the Virgin in Prayer, iconographies that flourished in the 15th century. The style of these prints is more difficult to characterize than the two above, and their compositions are more distant from the printed Books of Hours. Let us examine them in more detail. In the print at the lower left, Christ is depicted full face, and the framing stops at his shoulders even if we assume the print was trimmed down several millimeters. Rays of light and plant motifs of clover and palmettes decorate the nimbus. The artist has drawn such a clumsy network of lines around Christ’s eyes that he has a quasihypnotic look. 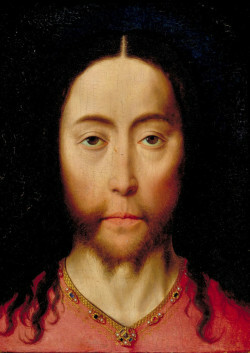 The frontal representation of Christ, without the hand making the gesture of benediction, identifies the image as the Holy Face of Christ, not the iconographic type known as the ‘Savior of the World.’ A similar composition had enjoyed great success several decades earlier, most notably in the Holy Face panel paintings attributed to Jan Van Eyck.11 The subject was taken up by other Flemish artists such as Dirk Bouts and his workshop, who painted several small tableaus of vera effigies of Christ, following the same model as van Eyck, in the last quarter of the 15th century.12 The emaciated face of Christ, the closed expression, the fixed gaze, long nose, forked beard, and the V-neck tunic trimmed with jewels are features of this print that draw from the Flemish vein. This impression is to our knowledge unique; no other copy has been identified by Schreiber or other print historians. The Virgin of Sorrows that faces Christ seems a priori to form a pair with it. 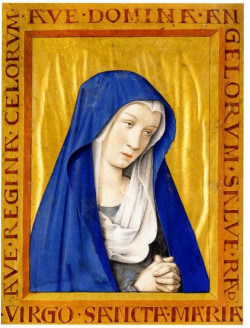 In works of the second half of the 15th century, however, the iconography of the grieving Virgin is more commonly associated with Christ Crowned with Thorns (as is the case in the late 15th-century diptych after Dirk Bouts, now reunited at the Louvre) rather than with the Holy Face.13 The Holy Face, meanwhile, is usually associated with the Virgin in Prayer, hands clasped, and not with the Virgin of Sorrows.14 The iconographic analysis suggests the two prints were meant to operate separately, and this idea is confirmed by the size of the Virgin block, which is slightly larger than that of Christ. It may be easier to locate a French source for the Virgin than for the Christ. The stylistic characteristics of the print are reminiscent of the art of Touraine in the late 15th century. The veil covering the slightly tilted head, the modeling of the face and its expression, gazing to the side with the pupils turned upward, evoke the Madonnas of Jean Bourdichon.15 The most convincing comparison between this print and Bourdichon’s work is probably the illuminated page in the Musée de Cluny representing the Virgin in prayer, dated around 1480- 1490.16 Some caveats are in order, however: Bourdichon’s female type is softer than the Virgin in the coffret, whose full lips and visibly blunter nose, do not completely correspond to representations of the mother of Christ by the artist.17 The style of Ypres may present a more relevant comparison, even if the figure of the Virgin is somewhat different from those in the prints that have been attributed to him, which are usually recognized by the high forehead and the tightened mouth.18 Here, however, the Virgin is veiled and the artist has chosen to depict her as more aged than in his best known works, where she appears as a young woman. 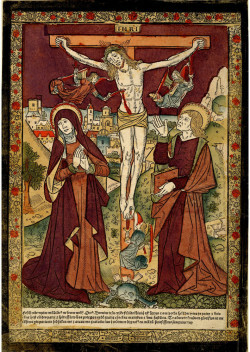 In a print of the Crucifixion that appears to be in the style of this artist, the Virgin figure shares traits similar to those of the Virgin of Sorrows.19 She turns from the vision of her son on the cross, and inclines her head slightly to the side so her face is seen in three-quarters view with eyes upturned, as in the coffret. The eyes, nose and mouth are quite similar between the two prints, although the lips of the Virgin in the Crucifixion print are more summary in execution. The artist shaded the left cheek and the bridge of the nose in an identical manner; the face finishes with a similar small round chin; the veil falls on the face in the same way; and in both cases there is a slight crease on the top of the head. 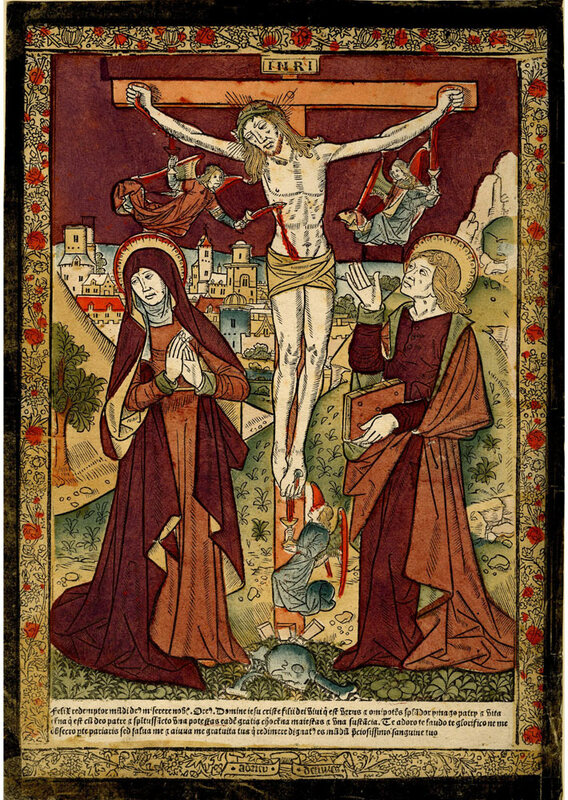 Jean d’Ypres, Crucifixion (Paris, late 15th century), woodcut, hand-colored with stencils. British Museum, London, Inv. 1902,0212.3. The print of the Virgin of Sorrows is not unique. It is known through another copy, which is preserved in the BnF and was identified by Schreiber, who considered it a Venetian work.20 The BnF engraving was heavily damaged when it was acquired as it had been kept in a manuscript before being forwarded from the Department of Manuscripts to the Department of Prints in 1873. The upper part of the veil is incomplete and has been filled out in pen, but the printing continues a centimeter down, revealing a kind of framework from which the figure of the Mother of Christ emerges beneath a decorative border of dolphins and foliage. Above, on a small strip of paper, is a prayer, written in pen in a late 15th-century hand and still legible. It is taken from a liturgical hymn belonging to the text of the Hours of the Virgin, which appears in several canonical hours (Prime, Tierce, Sext, None, Compline). It invokes the protection of the Virgin against evil and at the time of death of the faithful: [Maria] mater gratiae mater misericordia [sic] / ab hoste protege et hora mortis suscipe. The print box thus brings together three prints that belong to the same stylistic universe, but which differ in terms of their known usage—some have origins in book illustration—and in terms of dimensions. The montage of these four blocks may appear somewhat inconsistent at first sight, even artificial. Should we conclude that this ensemble is nothing but an assembly of matrices scrounged up by a workshop, totally meaningless, except for the purpose of making money? 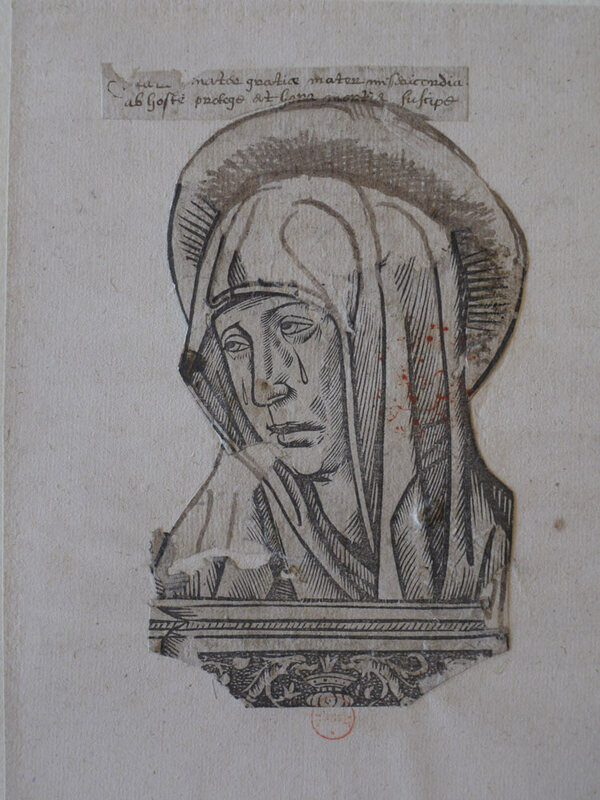 Virgin of Sorrows (Paris, probably late 15th century), woodcut. Paris, BnF, Réserve du département des Estampes et de la Photographie, Réserve Ea-5 (14)-Boîte écu. The iconography of the subjects invite us to think otherwise, as they correspond perfectly to the devotion of the late Middle Ages. The Holy Face of Christ symbolized both the humanity and the divinity of Christ. It was a very important cult image and the faithful were encouraged to behold it because the beauty of the face of Christ would bring comfort and guidance. The Virgin of the Litanies and the Virgin of Sorrows highlight the purity and the maternal suffering of Mary, elements that made her an essential figure of intercession between God and man. The frontal representation of Christ, the Virgin’s suffering and the deprivations of Job are iconographic springs that would have aroused the emotions of those who contemplated the images, and would have allowed them share in the suffering of Christ, his mother and the biblical patriarch. The prints in the coffret served devotion as it was practiced in the late 15th century, when the imitation of Christ in his physical and moral suffering was understood as the path to redemption. The visual impression made by the group together is also very effective: the red color used in the background unifies the four prints, and the blocks were arranged in the press such that the unprinted paper between them forms a white cross. The prints have been trimmed to fit the lid such that there is no white margin around the outside, further emphasizing the white cross within. At the center of the cross, a griffonis (scribble), perhaps the signature of the owner of the coffret, testifies to the intimate relationship between the images and the possessor. In the coffret à estampe, box and print together form a complete and coherent physical object. Without the print, the box is just a profane utilitarian container without any particular character. Without the box, the print would not be the efficacious image it is when glued to the underside of the lid, upright and vertical like a fixed screen, a pop-up window ahead of its time.